As model railway enthusiasts, we appreciate systems. Wheels and rail work together as a system to guide trains where they need to go. Command stations, power supplies, boosters, throttles, plug-in panels and decoders work together as a DCC system to control our trains. We’d be in dire straights without systems. It’s the most expensive drill I’ve ever purchased, but also – by far – the best. 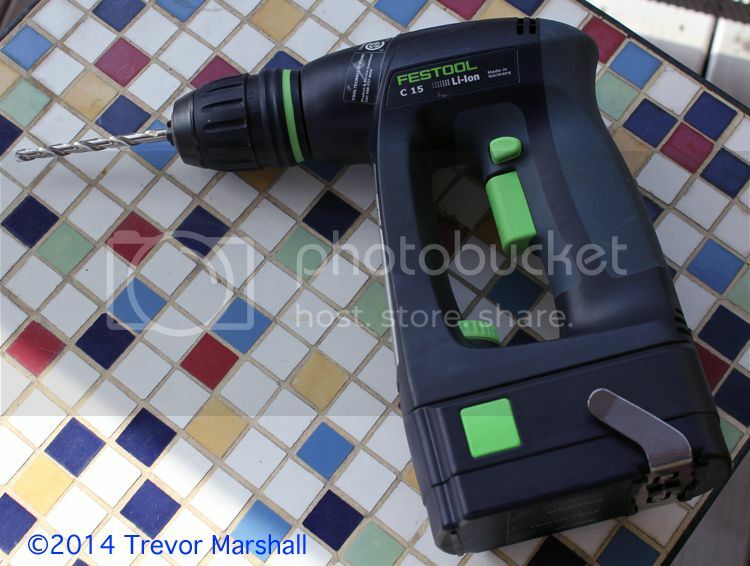 The other day while waiting for my number to be called at Lee Valley, I was looking through the Festool display and came across a handle that can be used with the driver/drill components to, for example, create an old fashioned screwdriver. That’s really handy for times when you need to turn a screw a quarter turn, but no more. I have lots of screwdrivers, so I would not have bought the handle – except that because this drill is part of a system, the handle also fits the chuck from the drill, which pops off the drill body so that one can fit other attachments. I often run into situations when working on models where I need to drill a hole, but I want very careful control over how deep I drill it, or how aggressively the drill attacks the material. As an example, I recently needed to enlarge a hole in the compensated truck subframes I use under my passenger cars, in order to clear a screw head. These subframes are laser cut from very thin ply so a light touch and precision control is important. The mega pin vise did the job in a spectacular fashion. More tools should be built with as much thought as Festools. Not cheap – but lifetime tools that I feel are worth the investment. 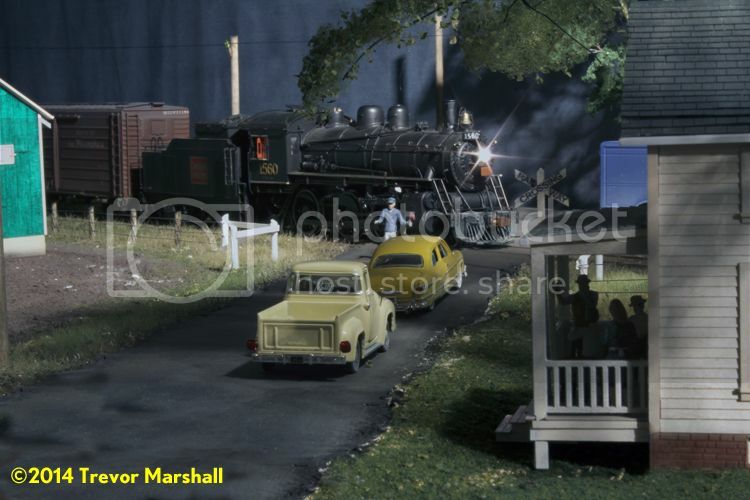 In response to my post earlier this week about my visit with Chris D’Amato from Railroad Model Craftsman magazine, a couple of readers expressed interest in seeing an article about my layout in the mainstream press. I’ve thought about this and at some point, yes, I will write a feature for one of the print titles. I know there are many hobbyists out there who are not reading this blog. They may not be online at all. I would hope that those readers would enjoy such a feature. 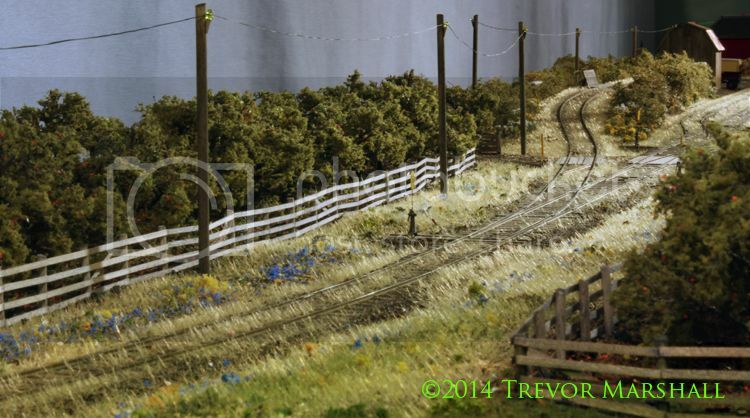 I would also hope that such a feature encourages more people to visit Port Rowan in 1:64. From that perspective, an article in a traditional print magazine sure makes sense. So, rather than assume – I’ll ask: What would you expect to see / read in an article for a print publication? 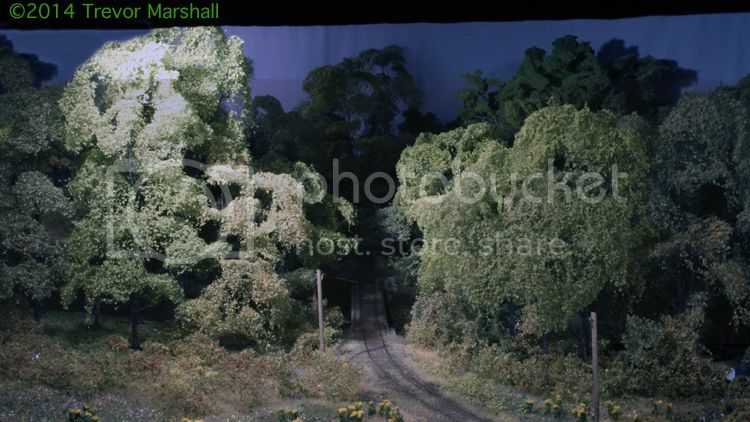 Keep in mind that many readers of a publication like Railroad Model Craftsman or Model Railroader will be completely unfamiliar with my layout, so overall the article would have to serve as an introduction to the prototype and my interpretation of it. 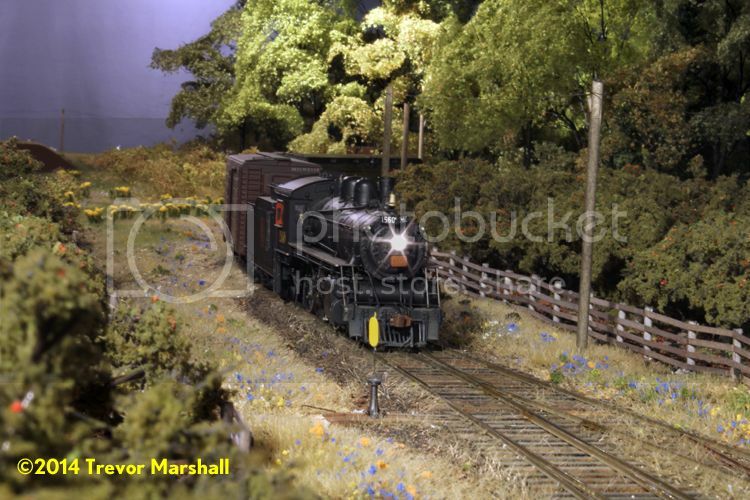 I’ve also submitted a few articles to Model Railroad Hobbyist, because I’m always impressed by the response when I post something to the MRH forums. And I’ve done some work for The Missing Conversation by Mike Cougill – and will certainly do more. Mike and I are like-minded modellers. While he models in a different scale, a different era and a different theme, we agree that this hobby can be a vehicle through which to spend a lifetime learning about and practising craftsmanship – providing one approaches it with the proper attitude. Finally, there’s video. I think the future of hobby publishing is in video. But that’s a topic for a future post. For now – I’m open to thoughts about a print article. No promises that I’ll use any of the ideas generated – after all, it’s my layout, my writing and my photography so in the end I’ll do it my way. But if there’s something I haven’t thought of, I’d like to know about it. 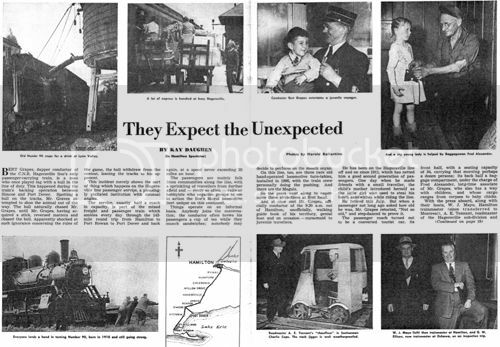 This article originally appeared in the Hamilton Spectator, and as I’ve noted elsewhere on this blog there’s a set of photographs from the article available online. 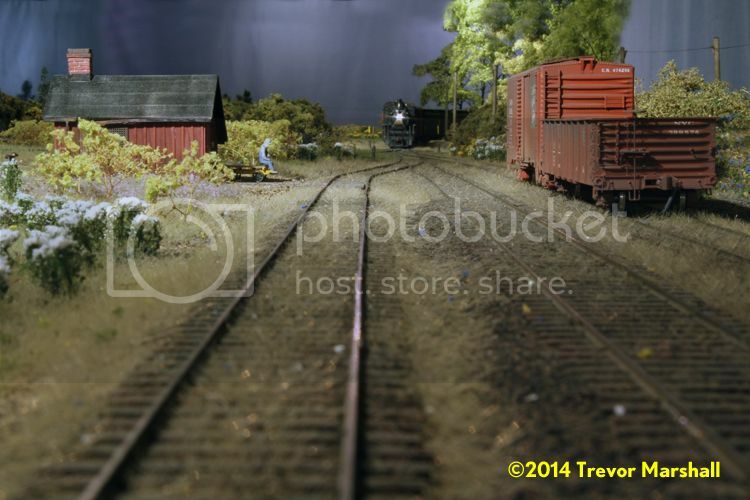 Having the words that go with the photos, though, provides a wealth of additional context for my layout. I was worried that glue would discolour the paper or make the ink run so to create the sign boards, I grabbed a strip of scale 1″ x 10″ lumber and put a short strip of thin double-sided tape on one side. I then trimmed the paper signs to size, stuck them to the tape on the 1″ x 10″ and trimmed the board to match the printed sign. To further protect the printing, I finished the sign face by sticking a piece of clear tape over the sign and trimmed it to size. To make the posts, I grabbed some round toothpicks. They’re approximately six-inches in diameter in S – perfect! What’s more, they’re sharpened to a nice point to stick into scenery. I cut the point off one end and filed two angles onto the tip, as on the drawings. I then located the sign and marked the front face of the post so that I could file a flat space onto it to mount the sign – a detail I picked up from Dan’s drawings. I glued the signs in place on their posts, then drilled and installed two Grandt Line 101 NBW castings on each sign, as indicated on the drawings. I had black plastic castings, so I didn’t even need to paint them. A quick bit of brushwork with some Reefer White finished the posts and the back of the sign boards. 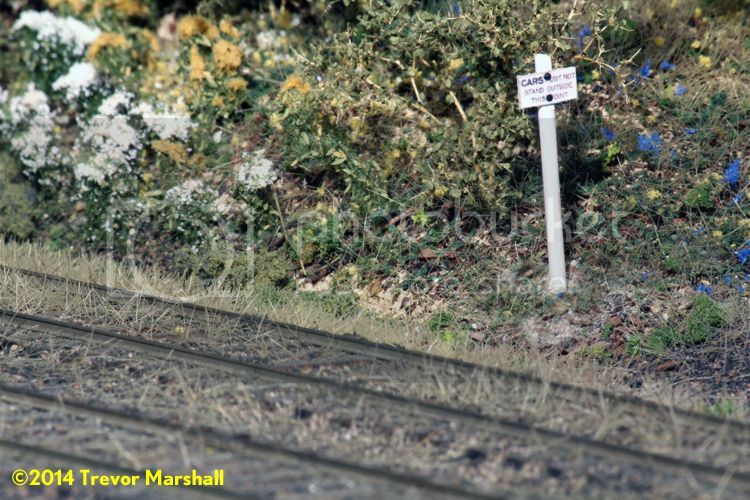 I put a mark on each post at the appropriate ground level, drilled holes in the subroadbed at the appropriate locations, and pressed the signs into place on the layout. They were a nice press fit – no glue necessary. I made one of each style of sign. I love adding little details like this to the layout. While they’re too small to read in normal operation, they do show up well in photos. Thanks for the data, Dan – much appreciated! Railroad Model Craftsman editor Chris D’Amato and his wife were in town over the weekend for the annual Doors Open Toronto festival and they stopped by on Sunday evening to see the layout. 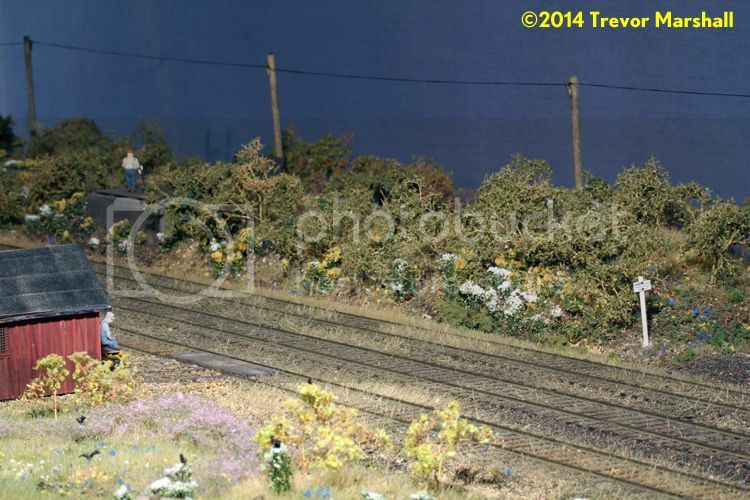 It was great to catch up with Chris – I haven’t seen him for a while – and to show off my layout to someone who has seen quite a few of them professionally. 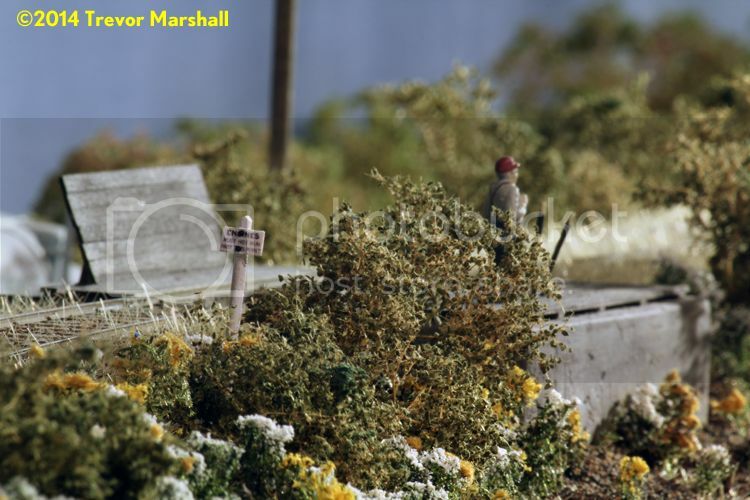 He and his wife seemed quite taken with the ambient sound I’ve added to the layout, as well as the trees and other scenery. 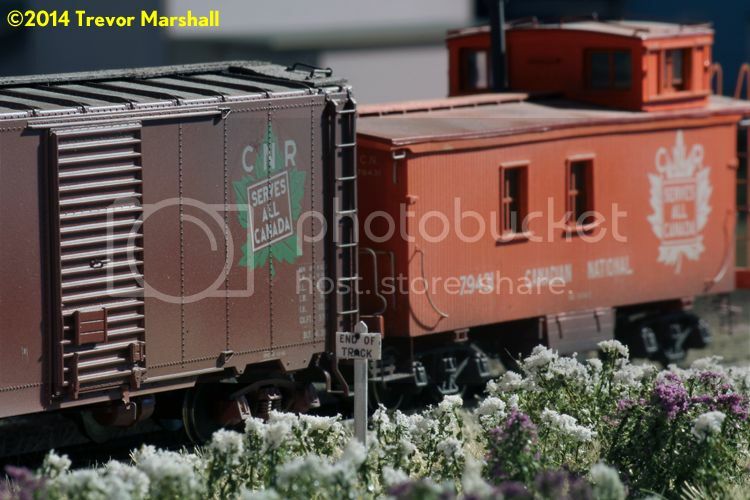 And Chris really liked the small CN steam power I run. Having completed their work in Port Rowan, the crew of CNR 2-6-0 Number 80 turns their mogul in preparation for the return trip to Hamilton. 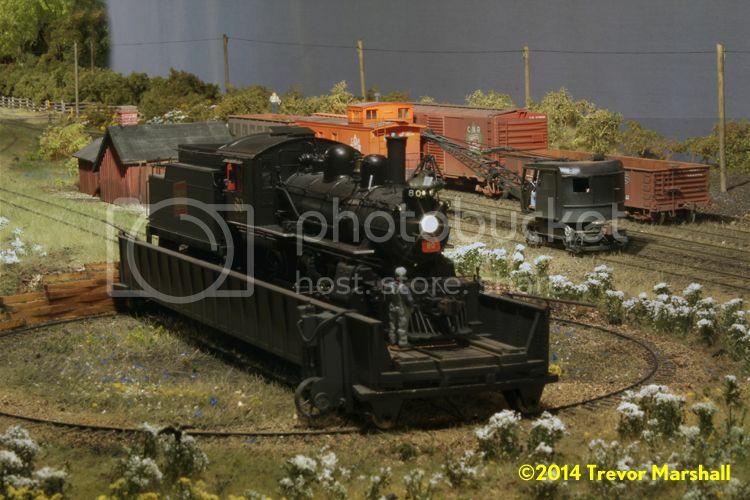 Number 80 has been on a work extra, delivering ballast from the pit in Hagersville to various places along the line. The crew is in Port Rowan to collect an empty hopper car: The Burro crane operator unloaded this ballast about a mile outside of town as part of a regrading project. With its engine turned, the crew of Work Extra 80 is pumping air and testing brakes before heading home. 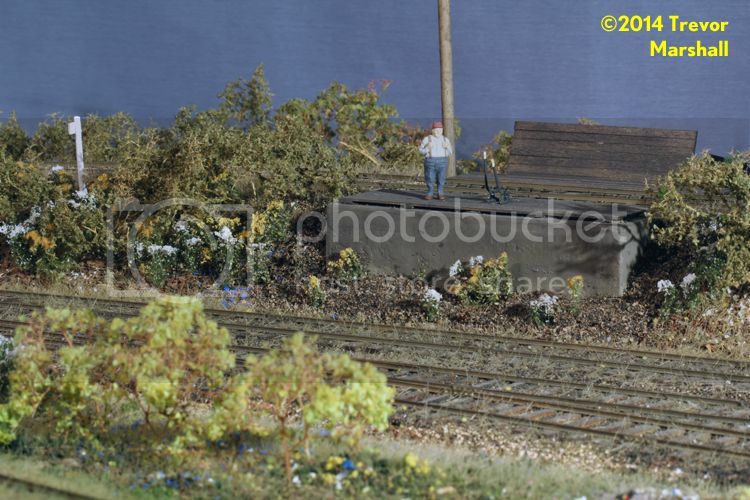 With a short train and a full head of steam, the engineer has decided he can make St. Williams in time to clear M233. The Burro, however, is too slow for that run – it’ll have to wait until the daily mixed arrives and leaves Port Rowan before starting the long journey home. Redwing Blackbirds gather in the meadow near the yard, and must be pretty used to the noise of the trains by now. With a flagman protecting Charlottville Street, M233 crawls through the crossing and into St. Williams behind 10-wheeler 1560. The folks on the porch are treated to this ritual twice per day, but they’re in deep discussion and pay it no mind. The head-end brakeman on Work Extra 80 has unloaded to give the mixed train a roll-by inspection as the two trains meet just west of the St. Williams station. With the meet completed, the brakeman lines the switch to let Work Extra 80 back onto the mainline at St. Williams. It’ll be clear running from here to Simcoe. Meanwhile, the M233 continues its journey. 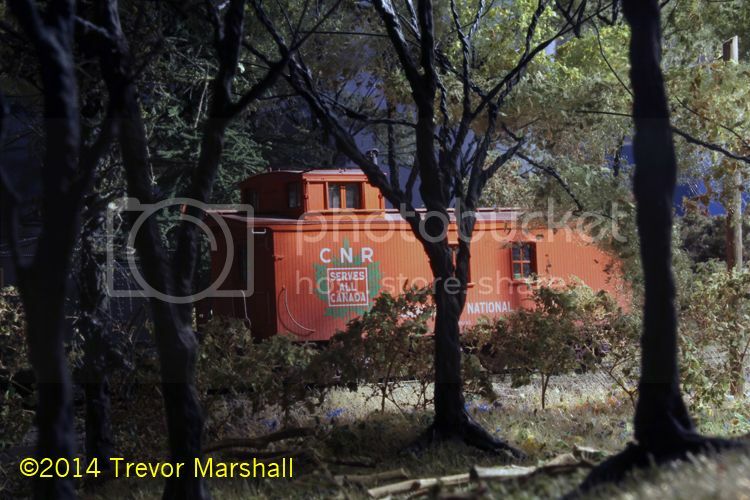 Having worked through the Lynn Valley, the train rounds the final curve and rolls between apple orchards as it enters the Port Rowan terminal. 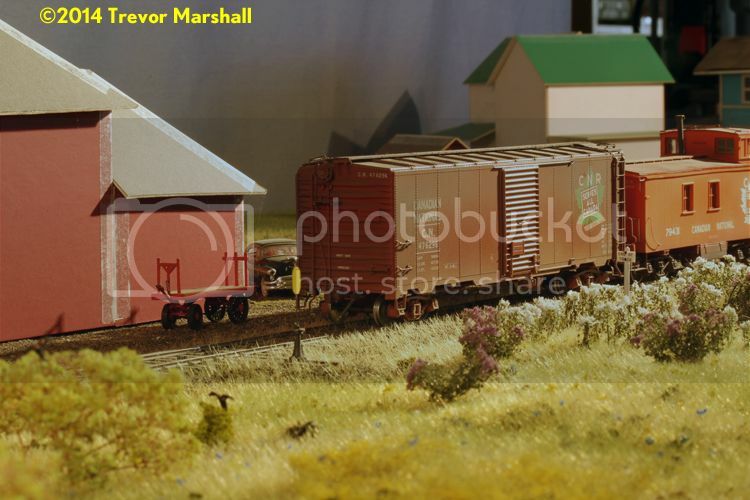 The Burro crane operator takes a break by the section house, but he’ll give M233 a roll-by inspection from his perch on the section gang trailer as the mixed train arrives in Port Rowan. The Burro is nowhere in sight – it must be parked well out of the way on the turntable lead. Chris: It was great to see you. Enjoy the photos – and come again soon! Thank you – and you – and you! Every so often, it has to be said. A friend emailed yesterday to remark that he’s impressed by the high-level nature of the discussions that take place on this blog – better, in his opinion, than what he sees on most newsgroups. As he put it, the Signal to Noise Ratio is much higher here. Obviously, he’s a buddy and we’re like-minded about many things in the hobby – and that’s going to skew his view. Also obviously, I have to take some of the credit for that by posting frequently and – I hope – thoughtfully about things. But the real credit goes to those of you reading my blog, and engaging with me and other readers through the “comments” feature on each post. I’ve been blown away by the thoughtfulness of the comments. I get lots of positive feedback, which is always encouraging. I also get lots of interesting information that fills in gaps in my own knowledge or adds context to what I’m doing. Equally important, though, is that when I get something wrong – or you disagree with something I’ve said – the corrections or the debates are gentle and respectful. I always feel that they’ve been offered in the spirit of improving everyone’s understanding of what fires us up in this hobby. I enjoy this interaction – immensely. Keep it coming. Thank you – and you – and especially, you! This is a follow up to The lesson of Bendy Elm – my post about asking questions instead of doing one’s own experiments. As I noted in that post, giving advice to others about the hobby is difficult because each person’s layout is unique – even if built from identical plans. From the physical environment of the layout room to our own idea of what is right, there are too many variables to provide the “right” or “best” answer. That doesn’t stop many people from trying, though, does it? Just as I see many people asking questions that are best answered by doing some first-hand experimentation, I also see many people delivering sermons on how things should be done. From layout design… to scenery techniques… to hosting operating sessions… to how to share progress with others via the Internet… these folks seem to think that the way that works best for them is the only way to do things. On this blog, I try to keep that in mind and temper my advice. 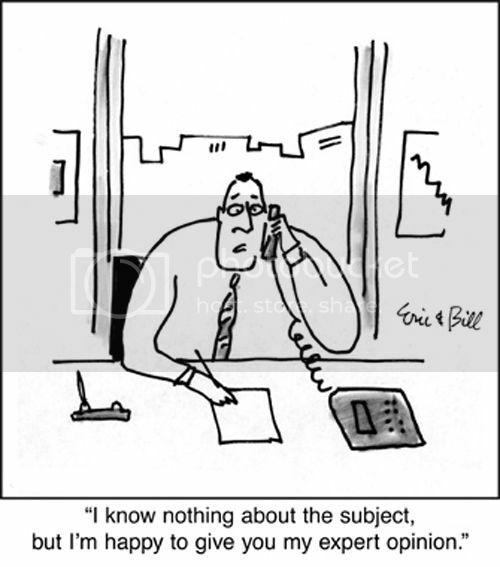 Fortunately, I’m not often asked for advice – because I’d be hard-pressed to offer anything useful. I’m not an expert and don’t present myself as one. Instead, I try to describe what I’m doing and why I’ve made the choices I have. While it’s a way to share my hobby with like-minded people, it’s also a record of my own progress in the hobby – so that in a year or two, I can ask myself, “Why did I do that?” and find the answer. If others get something useful out of this exercise, that’s great. A genuine expert would share the thought process(es) which led to their personal solution, rather than necessarily peddling a now out of date technique, material or product. I think this is the most valuable information one can share. If someone tells me, “Here’s why I did it this way”, I can then apply that thinking to my own layout to decide whether it’s appropriate to my circumstances. I could’ve answered “48 inches” and left it at that. But instead, I explained how I arrived at that figure. I think that’s a more useful answer. 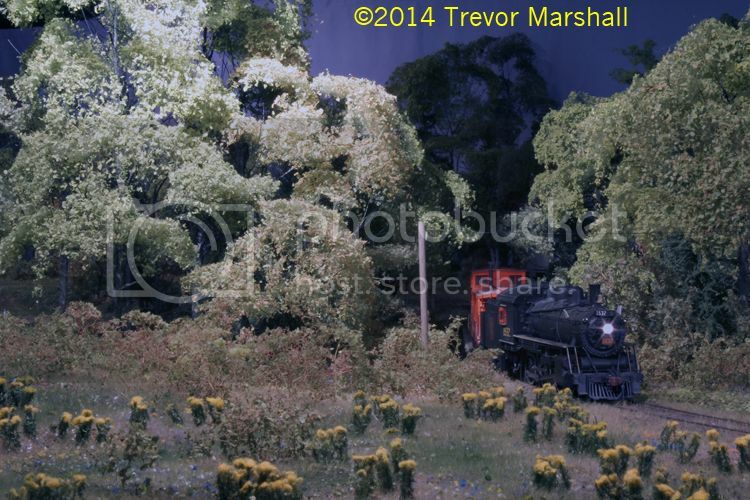 Prototype: Regardless of whether one models a real railroad or a freelanced line, elements added to a layout that respect the way things are in the real world will be more convincing. For example, lines running between utility poles sag. Modelling them pulled tight will be less convincing. Observing the real world – taking notes of what one sees, and determining why something is the way it is – is critical to getting it right on a model, regardless of whether one faithfully models a specific place and time. 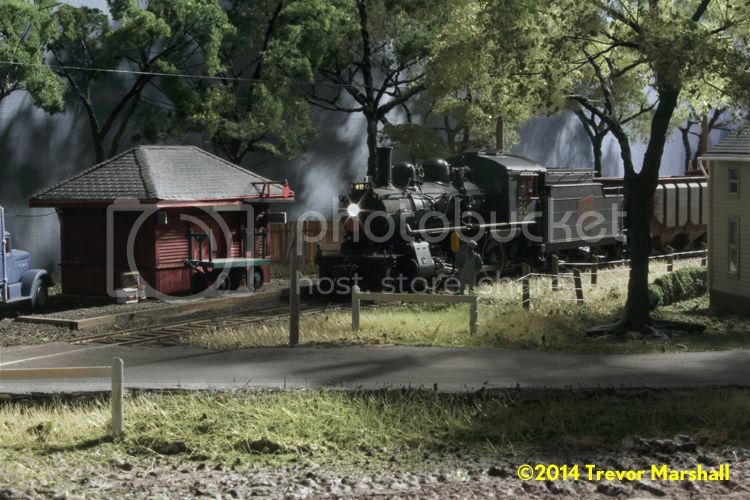 Practical: This is where the real world hits the layout world. It’s rare that we can model a real place exactly to scale. We need to work within the confines of the space we have. 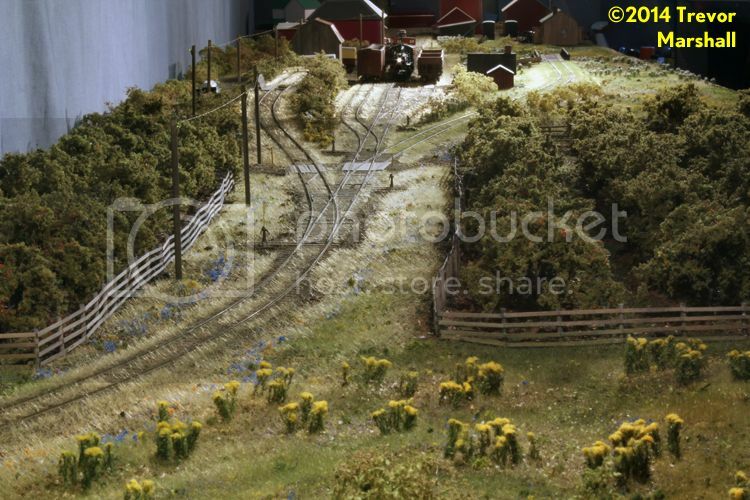 Even Port Rowan – a pocket-sized prototype yard – was too big for me to model full-size. I did manage to model it about two-thirds full size – and had to make decisions about where to trim the one-third away from the prototype in order to do so. It was a reasonable compromise, given my space constraints, since it still put the section house as close as practical to its prototype location. And moving the section house was a better choice than shortening the run-around or shifting the run-around to the right, which would’ve created bigger problems visually and operationally. 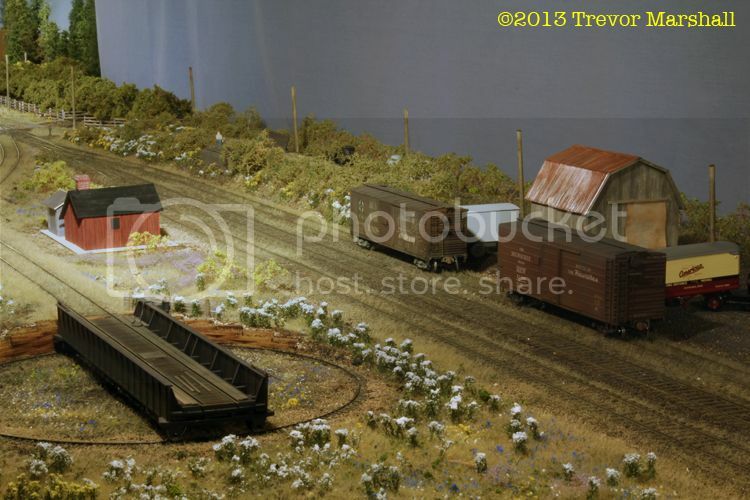 To put the staging area on the peninsula and tuck Port Rowan into the corner – again, not a great way to view the layout. I’m happy with both of these decisions – and the other choices I’ve made – in part because they were informed choices. 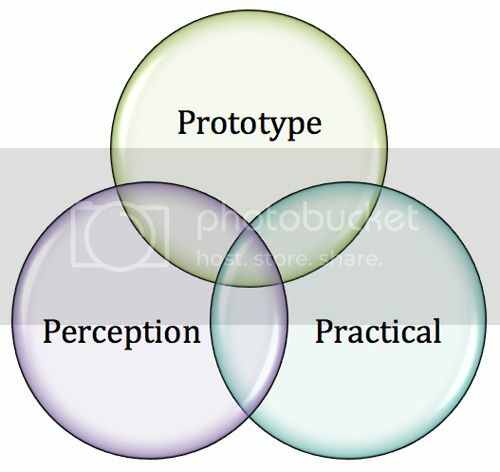 Understanding where I was deviating from my prototype – and why – was essential to arriving at these decisions. Perception: This is where we deviate from reality to influence the story that people take away from the layout – the perception we want to leave with visitors. It’s the artistic portion of the equation. For example, having Googled the site of the long-gone St. Williams station – in both satellite and street view – I’m pretty confident there was no tobacco field across the road from it, or tobacco kilns kitty-corner to it. However, I do know that such signature elements from the region bordered the tracks in Vittoria – the next station up the line – because I have a photo in my collection that shows them. Beginners in the hobby – or even experienced hands who are new to a certain aspect of the hobby – might be looking for a straight-forward answer to their questions. And “the experts” will provide – either online, or in hobby publications aimed at getting people out of the armchair and into the layout room (not to mention, into the nearest hobby shop that stocks their advertisers’ products). I did a dance and it rained. If you do the same dance, it’ll rain. The hobby equivalent is a set of instructions to build a kit. “Do as I did, and your kit will look like the one on the box”. 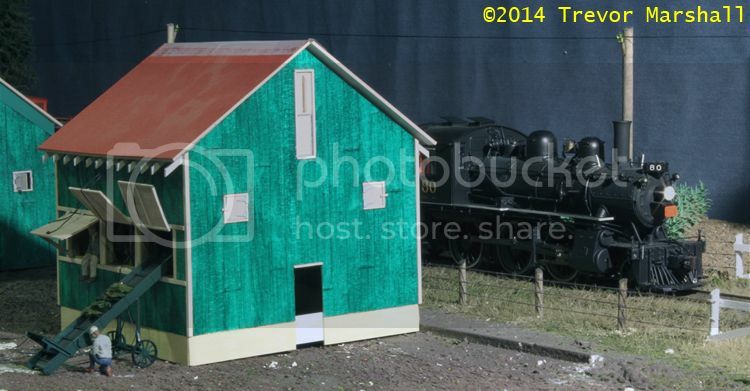 That’s excellent for a rolling stock kit, where the point is to create an accurate model of a specific prototype. It’s also very good for a structure kit – although unless one is building a kit based on a specific prototype in order to model the same prototype scene, one runs the risk of creating a layout that looks the same as everybody else’s. And certainly, getting people out of the armchair is important. But for most things in the hobby, I think the better approach is to encourage the hobbyist with the question to explore possible answers, then arrive at their own solution. After all, there’s only one expert on your hobby – and that’s you. 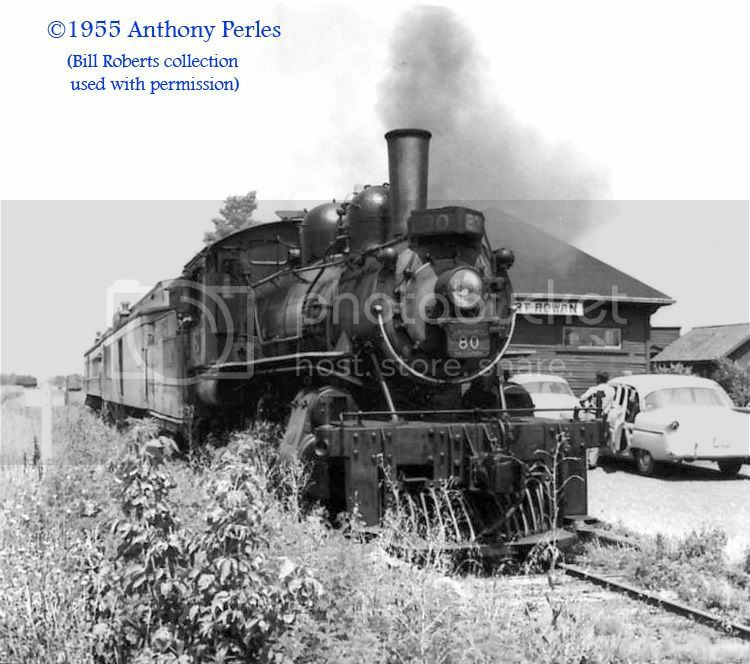 The mixed train to Port Rowan also served Port Dover – and the trip from Simcoe to Port Dover was fairly short, so it was done in reverse. To do so and still obey all the rules, I imagine the last car in the train (in this case, the combine) would have been equipped with a small air whistle, tied into the train line. A crew member – standing in the vestibule – would use this whistle to blow for any level crossings. 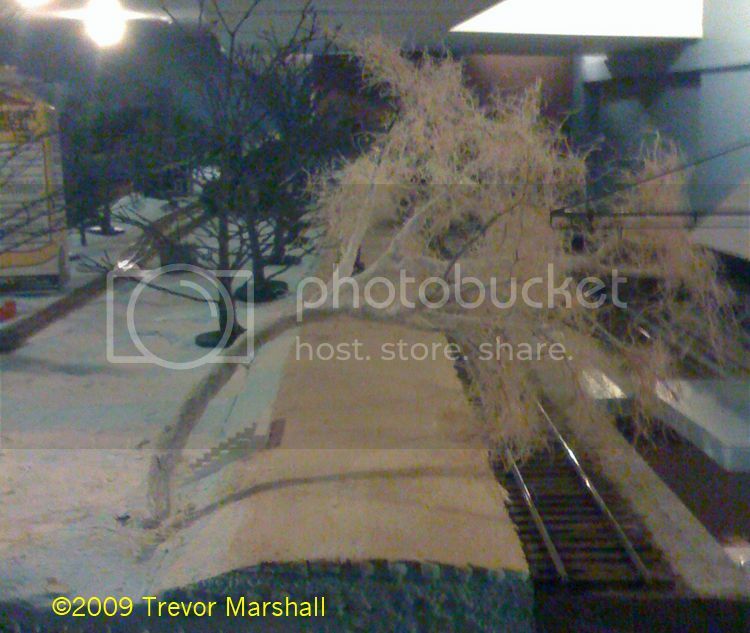 Even though I don’t need to operate the mixed train in reverse on the run to and from Port Rowan, I thought it would be fun to model this feature. 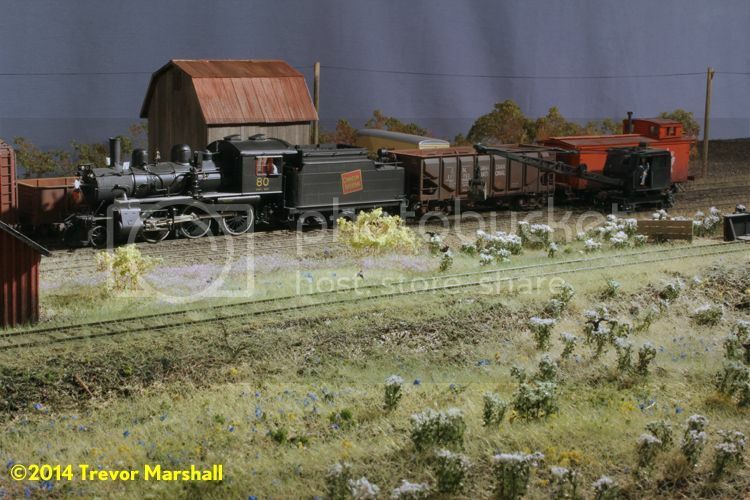 And my recent upgrade of the decoders in my 4-6-0s meant I had a pair of Tsunami Light Steam decoders kicking about – perfect for the job! Back when I installed the compensated subframes on my passenger cars, I did so on Combine CNR 7184 and Baggage-Mail CNR 7792. I then got into testing these cars in operating sessions – and while I’d built the new trucks, I never got around to doing the body bolster work to retrofit Combine CNR 7176. Yesterday, I decided it was time to address that. 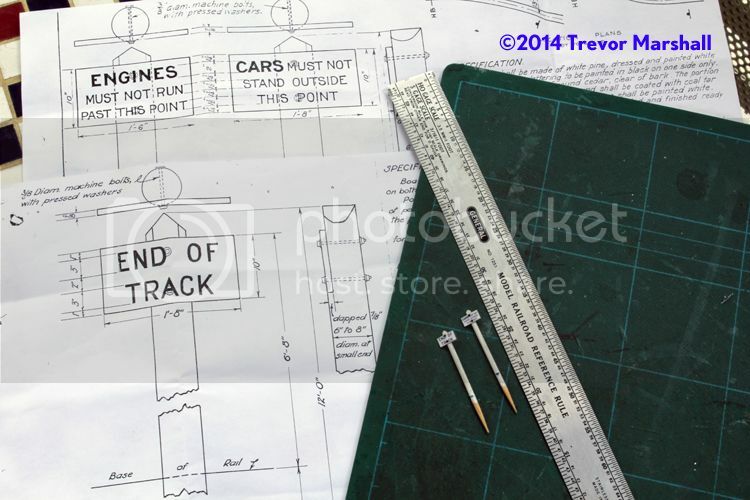 While prepping the car for its new trucks, I also drilled two holes in the floor (labelled “hole” in the lead photo). I threaded pick-up wires through these holes. I then found a suitable speaker with enclosure and installed speaker and decoder in the baggage section using double-sided foam tape. Under the car, I installed pick-up wipers bent from 0.015″ phosphor bronze wire. These went into holes drilled in the subframe and wipe on the backs of the non-floating wheels on each truck. The wires were simply secured in the holes with CA. The car only has four-wheel pick-up – which would be a problem if I was trying to run a motor and continuous sounds. But I’m not: I turned off the volume on all sounds except the whistle. I set the whistle volume low, and picked one of the “peanut” styles out of the whistle list. The keep-alive capacitor on the Tsunami seems to do just fine keeping enough juice on hand to power the whistle when needed. Plenty of audio exits through gaps in the vestibule doors. Since I have a second spare decoder, I’ll do the same upgrade to Combine CNR 7184 in due course. This installation offers up another opportunity for enhancing operations. My CNR rule book includes a section – Rule 16 – listing various Air Communicating Signals. These were signals communicated from the back of the train to the engine. The conductor could direct the engineer to start the train… to back up… to reduce speed… to stop at the next station… and so on. These were normally communicated through the signal line to a whistle in the cab. Since only passenger cars are equipped with signal lines, a cab whistle wouldn’t be in use on my mixed train or on a freight extra. So using such signals would not be prototypical on my layout. UPDATE: May 29, 2014 – I’ve now done the same installation on my other combine, CNR 7184. And I’ve enabled the “steam release” sound, at a low volume, so that conductors can use a drop in the train line air pressure to communicate with the engine if they so desire. It’s not as elegant as the whistle – the hiss takes a while to build, so it’s more difficult to do “short” and “long” codes than it is with the whistles, which come from the factory with “short” and “long” on separate functions. But it’s there. 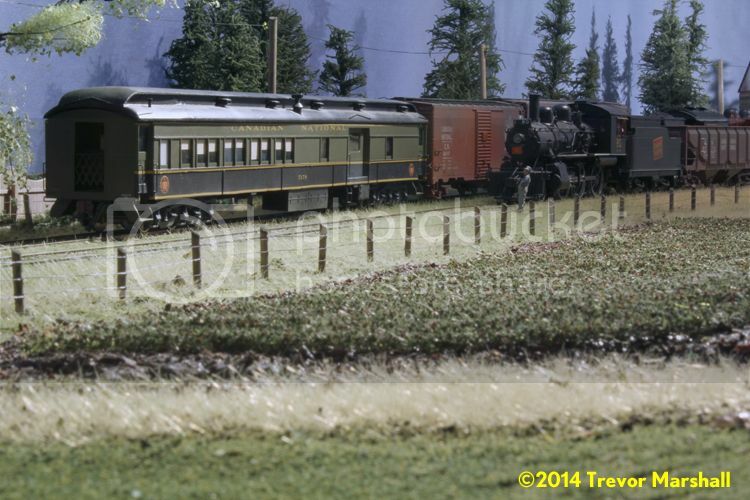 I should’ve mentioned in this post that I have left the lighting wires (blue, white, yellow) full-length on these decoders and curled them into the baggage area so that at some point, if desired, I can add lighting effects such as marker lamps that I can turn on and off as needed. But before I do that, I’ll modify the kits so that I can fit a speaker, markers and a decoder into them after Pierre has assembled them for me. That’ll give freight extras the same operations tools as the Mixed Train. I’m amazed this question still gets asked – but it does, and it’s an example of the wrong way to do the hobby. As an example of great questions, at one of our recent operating sessions my friend Hunter Hughson asked me if he could look at my airbrush and compressor. He was in the market for one. I’m sure he asked others in his circles the same sorts of questions. I’m sure he did other research. Then he made up his own mind, and bought the airbrush he thinks will work best for him. Well done, Hunter – and well done, to those of you who have asked great questions. We’ve had some wonderful discussions as a result and I’ve often changed my approach to something on the layout – for the better – because of the questions you’ve asked. But I see an attitude of helplessness on many newsgroups and forums and it’s time for all of us to fight back. There’s nothing wrong with asking questions, but this is a hobby of doing things. Those who experiment – and fail a few times – will learn something. I’ve done it a lot – and learned a lot. The lesson? Don’t do it that way! The lesson wasn’t expensive – it cost about $2.50 in materials and an evening of work. But in the process of doing and failing, I added to my knowledge base. The Gordon Gravett tree-building books have helped a lot, but I don’t follow Gordon’s method step-by-step. Rather, I adopted some of his techniques and materials, but married those to my own techniques and materials. I even carried forward some of the techniques I used to build the Bendy Elm to my current tree-building method. Take that sky-painting issue: How can anybody answer that? Only the layout owner knows how he or she perceives colour. Only the layout owner knows what mood they want to convey with their backdrop. 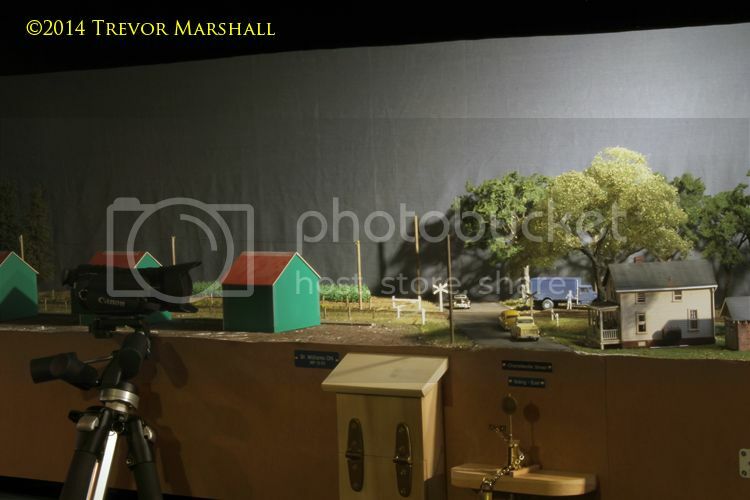 Only the layout owner knows what lighting they’re using for their layout. The answer is simple: Buy some blue paint that you think will work, and paint some sky. If you don’t like it, determine why you don’t like it: Is it too light? Too dark? The wrong tone? Then buy some different paint to correct for this. For another example, look at couplers. It’s not such a problem in S scale, because we only have a couple of them from which to choose – but there’s a coupler cornucopia in HO. What coupler works for a specific model? Rather than getting online to ask, buy an assortment of couplers and try them out. Create a set of test couplers and coupler boxes – like a socket set. Since couplers typically come in four-packs, find three like-minded friends, buy a pack of each of the couplers you’re most likely to use, and split the packs four ways. By doing this, you’ve added a tool – a coupler test kit – to your toolbox. You’ve also added to your knowledge base about the hobby. My own experience is that after testing you really need to standardize on one brand of couplers for reliable operations. Having tried McHenry and Accurail, half a dozen cars each over a several year period mixed into my fleet of Kadee #5’s (and cousins), I came to the conclusion that either the other couplers were not truly compatible (Accurail) or would not work reliably over a period of time (McHenry plastic springs). Operations suffered. Both types have been replaced. With Kadees. My thought about couplers was not to have several types from different manufacturers, but have several examples to test in cars. For example – standard shank, long shank, short shank. Center shank, offset high, offset low. Make up a set of these, maybe without springs or trip pins, and keep them handy so that when you buy a new car – say, one with McHenrys in it – you can use your test kit to figure out what Kadee works. Obviously, one can simply fiddle about with what’s in stock at home – but the point is, “figure it out yourself” rather than getting on a newsgroup and saying, “I just bought such-and-such a model: what coupler should I use?” Chances are, the answer won’t be that helpful: One person might recommend a Kadee, while another recommends an Accurail or a McHenry, and a third suggests Sergents. Is that really so wrong? Consider this: What if the “expert” who makes the recommendation is wrong – either because there’s a better choice (which you could discover by doing your own experiment) or because of another factor that means what worked best for them is not the best choice for you? Yes, we can learn from what others do – but it’s important to remember that each person’s layout is unique, even if they’re built from identical plans. The variables can be givens, such as layout environment: temperature, humidity, lighting, ceiling height, access requirements for utilities or closets – all will change what works for each of us. The variables can also be druthers: We have our own ideas of what is right – especially when it comes to subjective things like the colour of the sky. First, this is a hobby. With the exception of a few safety rules (such as, “Always wear eye protection when using a Dremel tool”), there is nothing wrong with trying and failing.